I finally got my hands on the hottest makeup brand of the year! 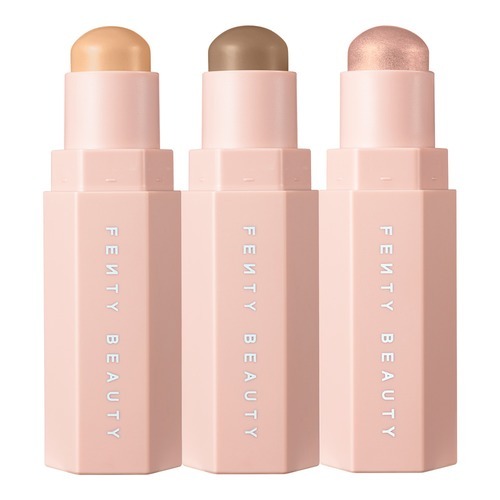 Fenty Beauty by Rihanna. 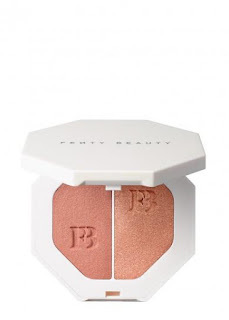 I was sceptical at first because I am not a huge consumer of makeup and it is still a very new world to me, but I was intrigued by Fenty Beauty. Maybe its the Bajan in me!! As I am not the biggest makeup person in this world, it is still a new thing to me. I have finally mastered a full face of makeup. I now understand the contour and highlight trend and am no longer scared of experimenting with different colours and looks. I guess you could say I am a makeup convert,because two years ago if you asked me what a contour was, I would have looked at you crazy! I had heard of Fenty Beauty via the instagram grapevine so I knew what it was, but didn't have a clue what it consisted of, just that is was by Rihanna, who I have become a recent fan of in the last two years for her carefree black girl attitude that speaks volumes to me. I am not the biggest fan of her music, but business and fashion wise, she slays daily! 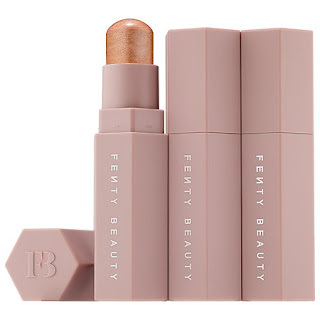 Funnily enough I discovered Fenty Beauty the day before the launch, don't know how I missed it as I follow BadGalRiri on Instagram. I watched the advert and I was hooked! I wanted to buy everything! When I saw Duckie Thot at the beginning, I knew Rihanna was not playing games with the makeup world. 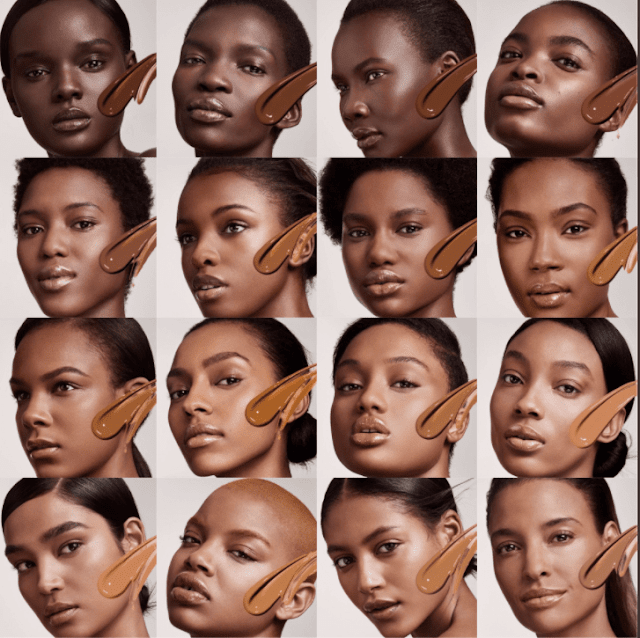 To have a dark skinned model as the first face you see in a beauty advert speaks volumes!!! 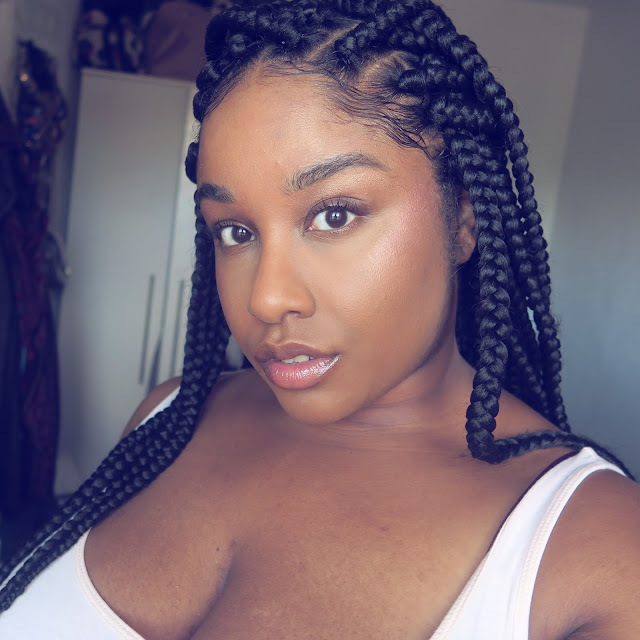 As this fashion/beauty constantly ignore the dark skinned women of the world, as if they don't exist, but hey that is another post for another day!! On September 8th, I was on the Harvey Nichols website, clicking and adding stuff to my basket, as if it was free. My total came to £175! Then I paused and said... hmmm.. do I really need all this stuff. Adulting came into play. I started budgeting in my head and thinking about what I could do with that money and decided, with my 30th birthday coming in November, someone could purchase it for me! 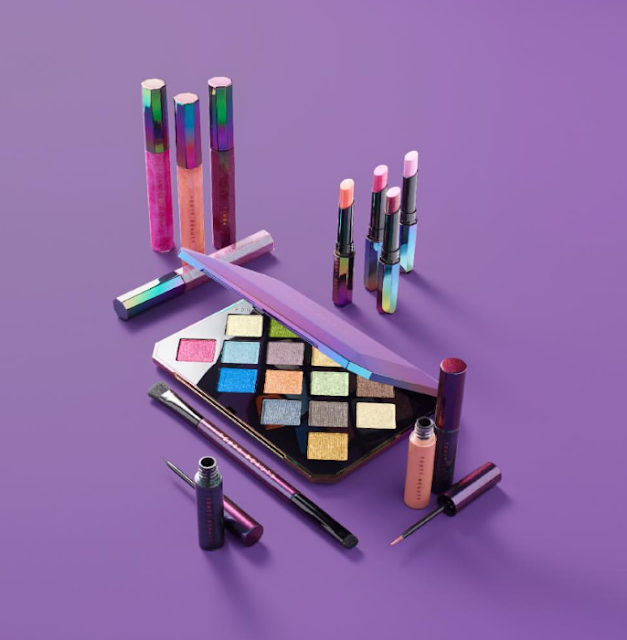 Then the birthday Gods heard my prayers and I learnt a PR company I had worked with for another makeup brand was housing Fenty Beauty and I contacted them, and they sent me some stuff. It was just all so exciting and magical!! (thanks Seen) Prior to this I had seen the endless queues outside of Harvey Nichols, that I was not about to join, as lets be real, I have been in that store once. I weren't going to go down there to wait for hours for makeup. 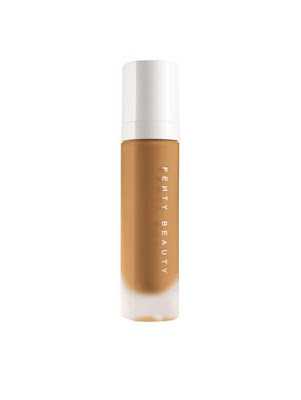 So since I didn't go to the store I had to figure out what shade of foundation I was via other's reviews on youtube and really study the photos on the Fenty Beauty website. 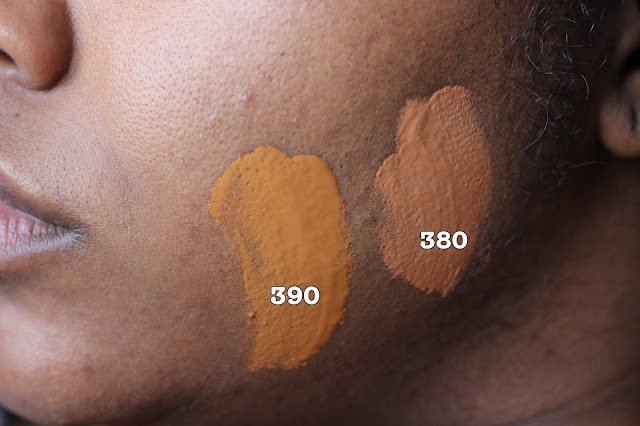 I have yellow undertones and am the shade Macao in Nars, Sechyelles in Body Shop and Clay 2 in Iman foundation, so I went off of that to decide. I came the conclusion that I was either 380 or 390. When the Pro Filter Soft Matte Foundations arrived, I literally ran to apply them to see which one matched. Now, if you follow me on snapchat you saw my whole drama with this foundation unfold. At first 380 was my perfect match. 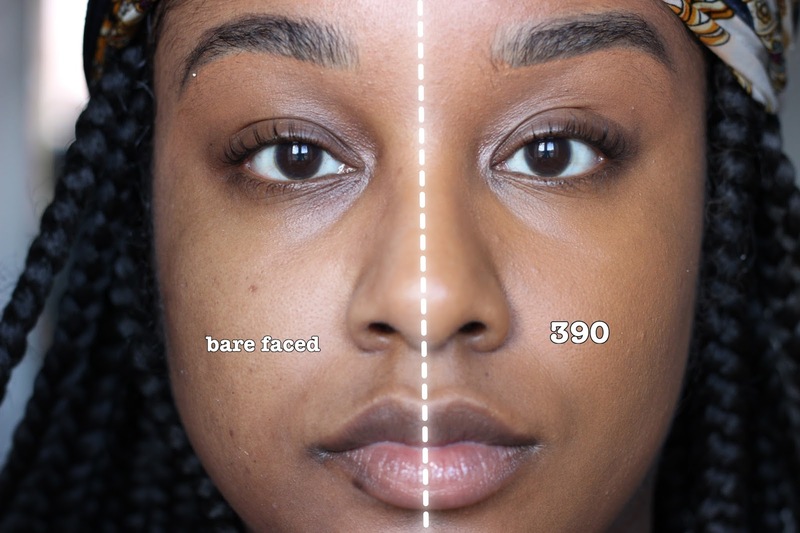 The foundation made my skin look flawless and I was so excited, but then 390 was an amazing match too and I became stuck. The problem I had was that my face is lighter than my neck and shoulders by about 1-2 shades. 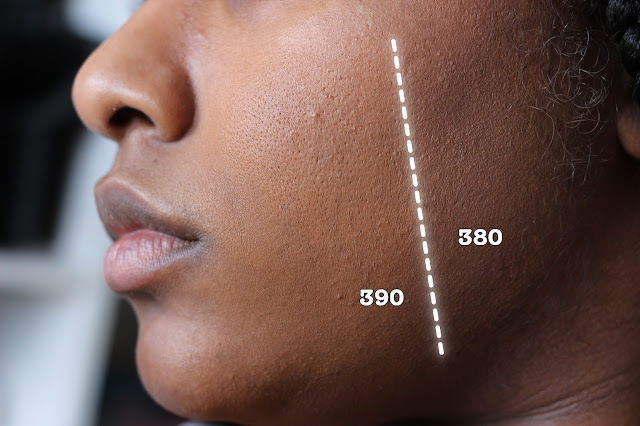 So 380 matched my face perfectly but not my neck. I have always matched foundation to my neck shade so it would be seamless, as I don't mind my face looking darker. Before making a final decision I wore 380 for the day to see how it performed on my face. By the end of the day, I hated it. My face had this red undertone that looked like I just ran 20miles! I then tried a day with 390 and noticed it matched way better than 380 throughout the day. The foundation does dry very quickly so you have to move fast when blending. As I don't like full coverage I always apply 1 and a quarter pumps per half of my face, therefore I have a sheer-to-medium coverage and my face still looks like me. I wear makeup to enhance not transform, so this was perfect for me. As the day went on, the foundation didn't move or flake, or get dry. It just sat still and behaved on my face! The only problem I had was the creasing around my mouth which became a bit flaky,but other than that, it wasn't an issue. The Pro Filt'r Instant Retouch Primer, is nice but didn't wow me, because from I understand it was created for those with oily skin in mind and I have dry to normal skin, so it didn't really impress me. It was soft on the skin and did help to make the foundation last throughout the day. 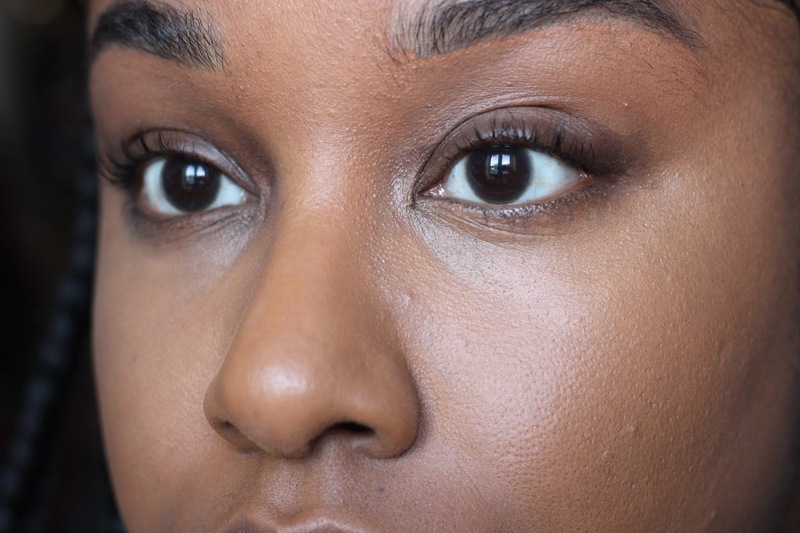 When it comes to concealer, I like to apply enough to cover my dark circles from late nights and early mornings, to give me an even tone and bright look. 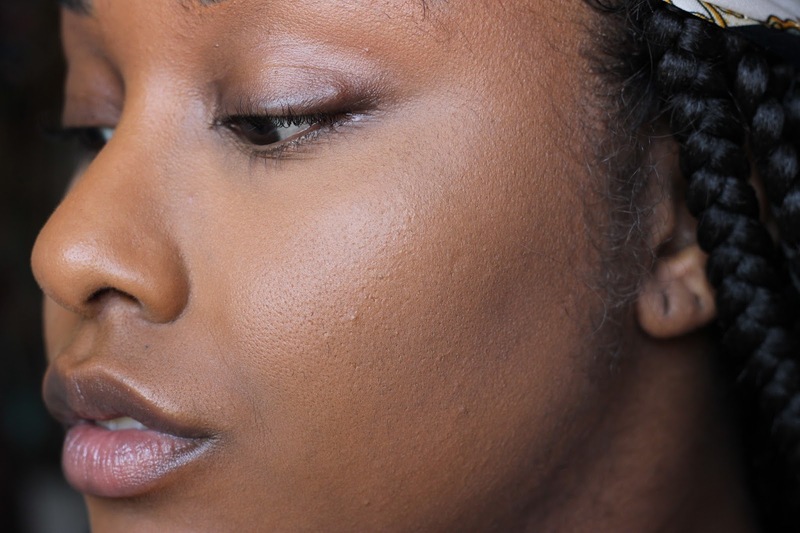 I am not a fan of really light concealers and like to use ones that are one shade lighter than my skin tone, i.e. 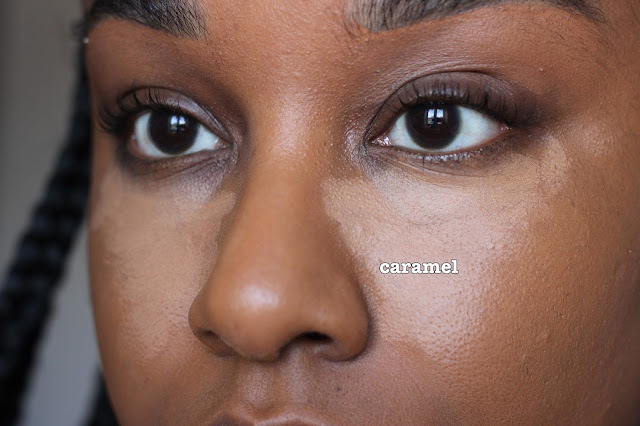 Nars Radiant Creamy Concealer in Amande. 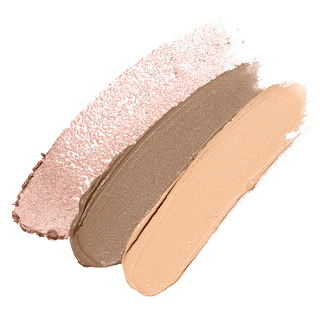 The Tan Match stix trio, shade Caramel, looked too light on application, but once blended in and set with my Laura Mercier translucent powder. It was perfect! My under-eye area looked brighter and clearer. I wouldn't wear it for my everyday look, but more so for a look that included eyeshadow. Contouring for me is still a 'if I want to' thing. I don't mind doing it but don't do it every time. 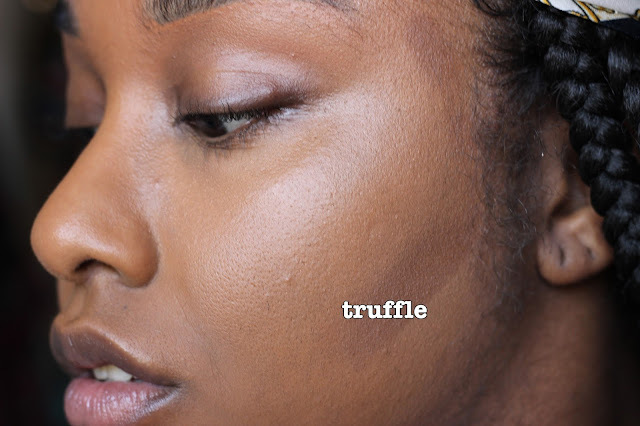 What I like about this Truffle contour in the Tan Match Stix trio, is the subtle look it gives you. It is very soft and natural. You don't look like a drag-queen,unless that is what you are going for! On to the stars of the show! Highlighters! The final Match stix in the Tan set is Rum. It is a lovely soft gold colour that reflects light ever so slightly. It doesn't look too dramatic and sits very naturally on the skin. 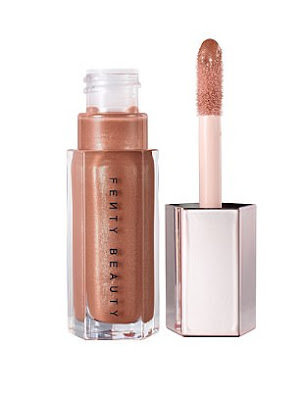 It would also make a great eye-lid colour for a subtle shimmer. I was sent two Killawatt highlighters and another Match stix, Metal Moon, Ridiiic and Moscow Mule\Ginger Binge. Metal Moon was way too light and doesn't suit my skin tone at all. Ridiiic is a high pigmented red/orange tone which looks nice when swatched but on my face it just didn't make any sense. I fell in loveeeeee with Moscow Mule\Ginger Binge. I don't ever ever ever wear blusher. It just never made sense to me for a black girl to wear high pigmented or bright blusher, I always thought it looked crazy and when makeup artists have done it in the past it looked weird to me. BUT this Killawatt changed my mind!! Ginger Binge looks soooo amazing on my skin that its my new obsession. It is build-able so you can be as blushed as you like, but it also very subtle, the perfect combination for me. THEN pack Moscow Mule on top and I'm in heaven!!! The girl who didn't give any cares about blusher and highlight two years ago is now converted!! RI RI!! You did that! I also was sent the Blotting powder, which will only be of use to me in settings such as a night club, where I usually get shiny and sweaty from the un-air-conditioned clubs in London! I have dry to normal skin, so I don't experience oil or sheen on my face, just sweat, which weirdly enough doesn't happen with these products. After watching all the reviews on Youtube, I didn't request Trophy Wife, because it just seemed pointless to me. I wouldn't wear it anywhere, unless I had on a bright yellow dress. It is a beautiful colour, just not for me! All in all! I am very impressed by Fenty Beauty. Rihanna you did ya thang!! You have these makeup brands out here shook and scared! Which if they catered for us black girls from the beginning it wouldn't have been a problem. Black women consume more beauty products than any other demographic and some brands leave us out on purpose because they want you to buy more than one shade to mix because they know you will!! Its such a disgusting concept!! I am glad Rihanna has recognised and made every woman of every colour feel visible! I give Fenty Beauty a 4 out of 5, simply because I wish she had released some lipsticks, as they are my favourite makeup product. BUT I know they are coming, after seeing the Holiday collection! If you like a natural face that looks enhanced and soft Fenty Beauty is for you. If you are used to a more dramatic, full face then I would say the hightlights would be of interest to you. I am using it for some time now and it is amazing!! All of these items are looking so good on you. 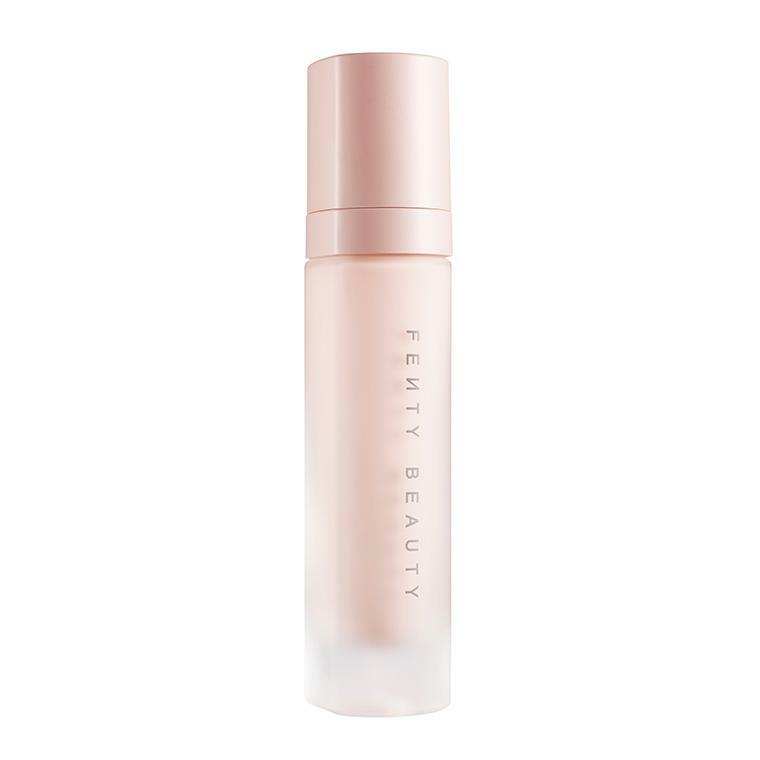 I really want to try this foundation. Recently, I did fall make-up lesson ,but I don't have much idea about makeups. Till I am willing to try this one. I am in the shade nc40, can you please suggest a shade for me?